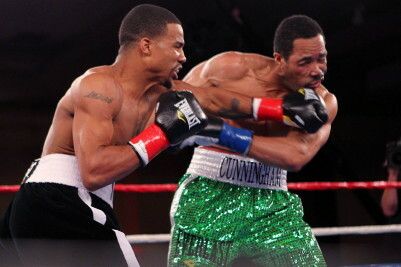 Photo: Casino/SHOWTIME – By Scott Gilfoid: Andre Dirrell (20-1, 14 KO’s) looked as if he had never been away from boxing tonight in stopping Darryl Cunningham (24-3, 10 KO’s) in the 2nd round and showing power that had SHOWTIME analyst and former world champion Antonio Tarver very impressed. Dirrell really is sitting down on his punches now a lot more than he did two years ago last time he fought. It could be that he’s now matured fully and has gotten his man strength and is just now starting to show it. His KO of Cunningham wasn’t just because he was in with an overmatched opponent. Dirrell’s power and speed was very impressive to say the least. I seriously think he would knockout any of the top contenders and guys like Kessler, Bute and Froch. Dirrell already had Froch staggering on two occasions two years ago in their fight and Dirrell really only threw two hard shots in that fight and had Froch staggering both times. If Dirrell was throwing like he was tonight back then, Froch would have been in serious trouble. When you’ve got a guy like Dirrell with amazing hand speed and a lot of power to go along with it, it’s difficult for anyone to take those kinds of lead left hands the way he was throwing them. It’s especially difficult to take those shots when you’re slower like Froch, Kessler and Bute. They’re all slower than Dirrell and would be getting hit cleanly his left hands the same way Cunningham was. I kind of doubt too many of the top contenders or champions are going to want any part of Dirrell after tonight’s showing. Dirrell has got too much talent, too speed, and too much power for the slower fighters.